I have been a fan of Ed Miller’s ever since I ran across Two Plus Two back in 2005. I found the work he did back then eye-opening, but slightly over my head. I’m not sure if it is indicative of an improvement in his writing or an improvement in my capacity to understand what he writes, but his more recent books make a ton of sense to me and have greatly improved my game. Miller’s latest book, Poker’s 1%: The One Big Secret That Keeps Elite Players On Top, is no exception. In this book, Miller tackles a concept that he calls an “open secret.” It’s open because others have written about it before — most notably, Matt Janda in his book Applications of No Limit Hold’em and Bill Chen and Jerrod Ankenman in The Mathematics of Poker. However, it’s a secret because most people have a hard time understanding the type of math presented in those books. I’m a math teacher and even I found a lot of previous discussions of the math of poker tedious. But Miller has a knack for simplifying difficult concepts in a way that most people can understand. If you are mathematically challenged, or just lazy like me, then you’ll love Poker 1%. This is not to say that Miller has made becoming one of Poker 1% easy. Most readers will find that understanding the work that needs to be done will not automatically make them more likely to do it. Miller points to the difference between knowing how to lose weight and actually losing weight to illustrate this point. Miller would make an excellent grade school teacher with how well he uses diagrams to explain complex concepts. One of my favorite from the book is his use of a pyramid to explain how often you should continue in a hand. The bottom of the pyramid is it’s widest point. This is how you should visualize your preflop range, Miller explains. As you move up the pyramid, it gets narrower and narrower at a consistent rate. This should happen to your continuing range as you move through the streets of a hand. Miller has found that most people’s pyramids do not narrow as consistently as they should because they either fold too often or continue too much on later streets. These tendencies cause hitches in the sides of their pyramids. Want to get better at poker? Simple. Smooth out the sides of your pyramid. And don’t get your school clothes dirty at recess. But of course, this process is not all child’s play. The pyramid graphic gives you a glimpse of the end goal, but you have to get in the trenches and do the leg work to correct your own personal pyramid. If you are an absolute beginner, the book may leave you with many questions. For instance, Miller says that most people play too many hands preflop and fold too many hands postflop, i.e. their pyramids are too wide at the bottom and narrow too quickly. But what he doesn’t tell you is exactly which hands to play preflop or which hands to continue with post flop. That’s because the problem isn’t the same as telling you how many sit ups you’re going to have to do to wipe out that Oreo you just ate. Each game is different, each player is different, and therefore, each range is different. You have to do your own grunt work. To help you get started, he suggests a simple, but highly detailed process while also recommending further resources. Those who choose to do the work and follow the rules Miller has laid out in the book will improve at poker. Those who do not will ensure that the open secret of Poker 1% remains hidden in plain sight for years to come. 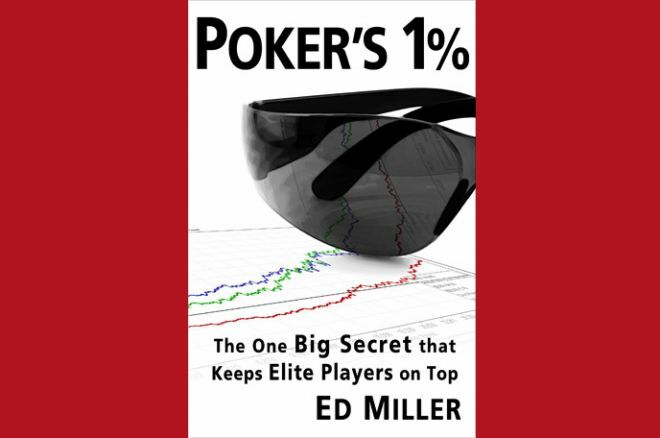 Poker’s 1%: The One Big Secret That Keeps Elite Players On Top by Ed Miller is immediately available as a PDF download at the author’s Noted Poker Authority website where one can also pre-order paperback and e-book versions.